Brooke is the Marketing Director at Kevy, an Atlanta-based cloud integration company. Her team is responsible for building and maintaining an inbound engine to educate and engage users, and bring in new leads. They aim to write one eBook and one-two customer success stories each quarter, and two blog posts each week. 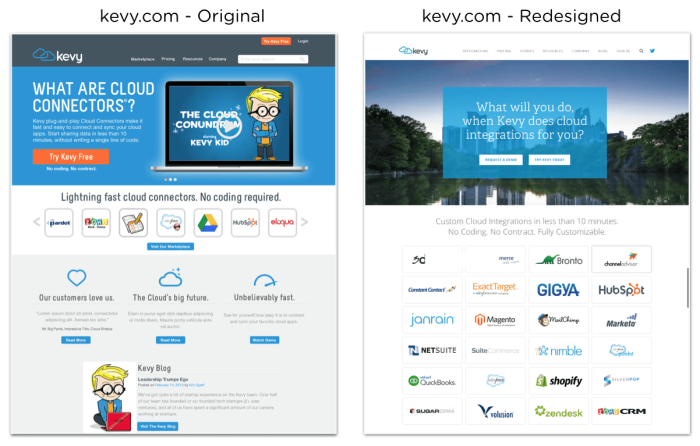 They also are responsible for writing support articles for 600+ cloud integration combinations Kevy offers. Brooke decided early on that Kevy would be scrappy with their content creation. Rather than increasing headcount, paying contractors, or writing articles for all 600 integrations, they looked to their existing marketing tools to understand how to prioritize and create content efficiently. They created a system that combines data from website analytics from Google Analytics and Moz, marketing automation from Pardot, and live chat from Olark to optimize their content marketing workflow. Kevy uses Moz and GA to understand which keywords lead people to kevy.com and which pages are most popular. Every month, they look at the top 10 keywords people use to find Kevy and the top 3-5 pieces of content that received the most interaction from reads to social posts. They cater their content to use the words people are already using to find them. 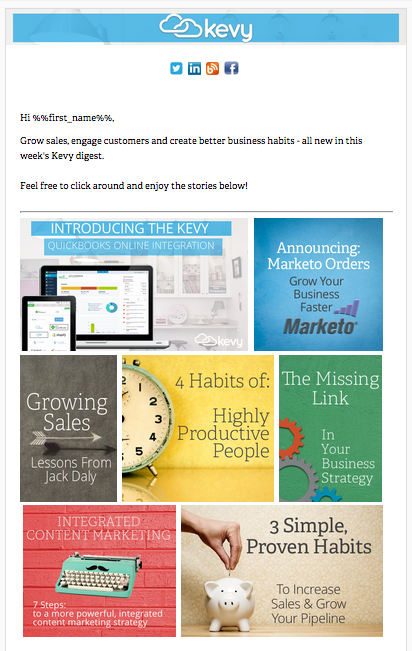 An example of Kevy’s newsletter. Then they use Pardot to gauge engagement through the month-end content newsletter—a dynamic email that compiles the top stories. “The stories with the most clicks/views are what we consider to be the most engaging so we will dive deeper into those topics the following month,” Brooke said. Their content newsletters receive, on average, a 35%+ open rate—very impressive considering averages are between 20 and 25%. This data from Moz, GA and Pardot is rolled into a month-end review that highlights the content with the most clicks, views, email opens and social shares. But the evaluation isn’t entirely quantitative. Here’s where live chat comes in. Kevy uses Olark for observational context to understand the content that readers find interesting or confusing. Pages like pricing and the FAQ section sparked the majority of chats—people asking for clarification on some of the explanations. In the beginning, they answered these questions on chat, but soon realized that permanent web content and sales collateral would address the demand for these questions at scale. This method proved to be highly valuable. Rather than waste weeks by writing content on all 600+ integrations, the team looked at what integrations people were chatting about most and used that insight to write specific content for high-demand integrations. This past summer, Kevy used the insights from its optimization tools to launch its new website. Sections such as ‘stories,’ ‘resources,’ and the Kevy blog were all re-vamped, but Kevy’s FAQs and Pricing were altered the most. FAQs were arranged from most asked to least asked so the most frequently asked questions were front and center. “We’ve had incredible feedback from our new site. We immediately noticed an increase in conversions and have seen an 11% increase in leads since the launch of the new site,” Brooke said. The new, more targeted site has resulted in fewer questions from customers, so live chat is used more as a sales extension and less for content feedback. The team uses a new platform for content feedback now: a User Community. To aggregate requests and ideas from customers, they built the community as a dedicated channel to engage with customers and build on those ideas. Optimization shouldn’t be strictly statistical (say that three times fast). Numbers will tell you a lot, but to get the full picture combine quantitative and qualitative feedback. It might take a little more time to capture and catalog this feedback, but in the long run, it will help you make better-informed content decisions. Adding chat functionality to your site can also help you understand your customers’ needs better, while building trust and engagement. The more proactive you are as a business, the more your customers will trust your dedication to their success. How you can optimize content like this. 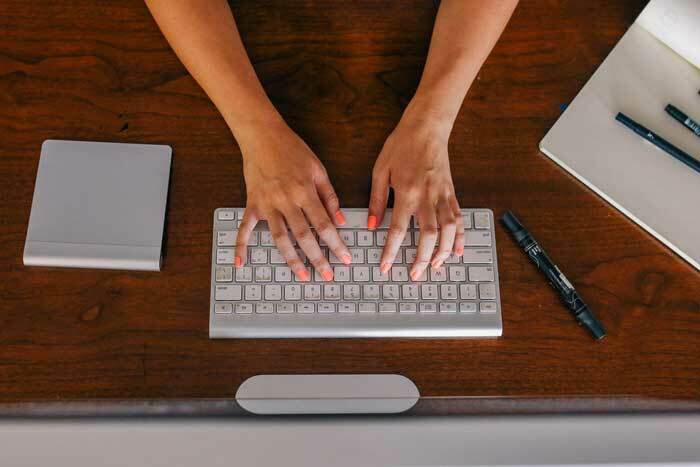 Do you send out articles via email? Measure which ones drive the most opens and clicks. Analyze month over month traffic for your content pages or blog posts. Add a live chat widget to your content pages and especially pricing page. Compile all of this data into a monthly review. Examine which topics were most talked about, what people had the most trouble with. Prioritize a list of new articles based on this. This article was written by Karl Pawlewicz from Business2Community and was legally licensed through the NewsCred publisher network.